Over the course of the year, I’ve had the pleasure to meet many talented and forward thinking individuals in the industry.Your dedication and effort to be successful in an increasingly competitive industry is evident. Based on my discussions, it is clear to me that innovation is a key element of success when competing for more sales and better margins. Some of you agree that technology has a role to play and some of you, not so much. But one thing that seems to be constant is the realization that the transition from analog to digital in the polymers industry is here to stay. As representatives of an industry that brings so much value to your customers, you must always strive to integrate innovative solutions to outdated operational and commercial models; especially when times are good. Be mindful that the arrogance of success can make you think that what you did yesterday will be sufficient for tomorrow. The digital age is here. The evidence is confirmed with every electronic message you read and send, every time you turn to your smartphone or tablet for knowledge and with every purchase you make online. There is no turning back. We hope to see you in the coming year and share ideas on how to make your company’s transition to the digital age simple, effective and profitable for all. 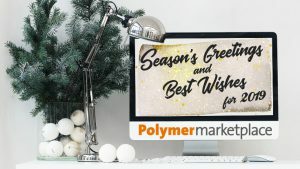 From the desk of the CEO of Polymermarketplace.